One of my favorite meals is meatloaf, so the thought of going the whole summer without it because we will be on a camping trip without a stove wasn't very appealing. So, I decided to come up with a way to turn one of my favorite foods into a foil packet meal that I could place on our portable grill. I made my regular recipe and then placed it in a foil packet and it worked! It was moist, delicious and perfectly cooked! Step 1: Mix all ingredients together in a bowl. If the mixture is too loose and wet, add a tad more bread crumbs. Step 2: You can either use the shorter roll of aluminum foil and make two smaller meatloaves in two separate packets, or use the longer aluminum foil and make one large meatloaf packet. I laid down two separate packets double layered with heavy duty foil, with the dull side facing the food. Be sure to spray so it doesn't stick. Step 3: Form two small or one large meatloaves and place on the foil. Gather the two sides that the top and roll to fold over. Roll the sides closed and leave a little room for cooking and expansion. Step 4: Place on the grill over low-medium heat for 15-20 minutes, you can remove from the grill and open the packet at any point to check the meatloaf. Pull the meatloaf from the grill when it is finish, unwrap and place ketchup on top while letting it sit for several minutes. What is your favorite meal to grill during the summer? I would never have thought about making meatloaf on the grill! My favorite thing to grill is fresh veggies out of the garden! Yum! Gotta like that there is little clean up. I like to substitute BBQ sauce for the catsup. Interesting! I would have never thought of preparing meatloaf like this. What a great idea to make it portable! Also, thanks for the reminder to spray the foil! THat is a an awesome idea! What a good idea! We really like grilling Pork Tenderloin and Chicken Breasts. That reminds me Tammy, I got a great recipe for a grilled pork tenderloin that uses curry powder the other day from Publix. It swelled heavenly when they were making it. 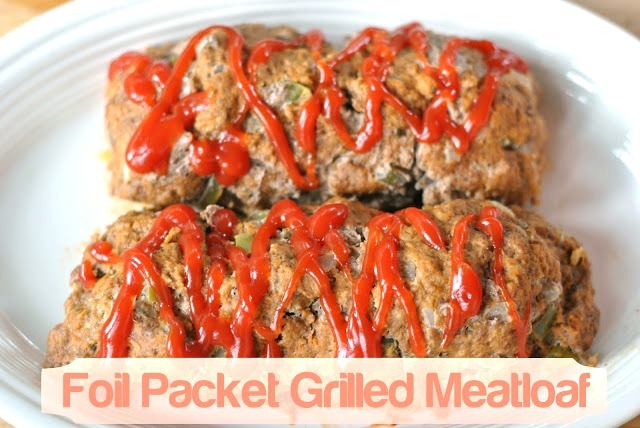 I am not too handy on the grill but my kids love my meatloaf, so this is a wonderful alternative cooking method to keep in my back pocket. I love me some hamburgers on the grill!